Powercolor may be prepping custom AMD Radeon VII graphics cards for launch sometime in the near-future. 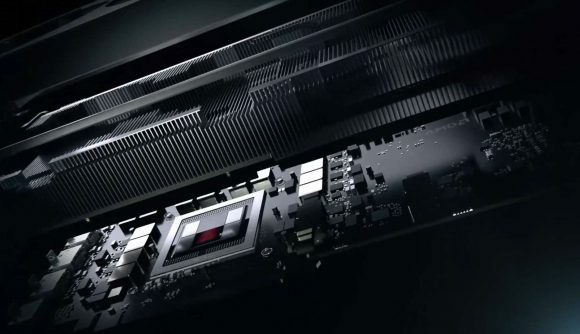 While AMD is passing up on third-party Radeon VII graphics cards at launch, custom coolers and overclocked GPUs could still be on the way sooner than expected. That is to say, sooner than never. You can’t blame us for being a little pessimistic. After AMD Vega’s custom card dry spell for many months post-launch, and board partners this time around claiming “you cannot leak anything that does not exist” in regards to custom Radeon VII designs, non-reference designs looked to be non-existent. But the latest word from serial leaker Komachi proves otherwise. While not quite on par with the likes of AIBs such as Sapphire or XFX for their dedication to red team silicon, Powercolor was one of the first to get tardy custom Vega cards out the door. And it looks like the same will be true for Radeon VII, too. We now have scraps of evidence pointing toward four custom Powercolor Radeon VII cards. Of these four cards, two feature stock clockspeeds and two come with factory overclocks. These are also subdivided into Red Devil and Red Dragon cards, the later has, in the past, featured a more subtle, neutral design that the former. We can only speculate on the cost of the above graphics cards, but we can’t imagine their price tag falling cheaper than $749 – $799. Factory OC cards will surely cost a pretty penny. Powercolor might be, inadvertently, firing the starting pistol for other manufacturers to create custom Radeon VII SKUs, or it may be capitalising on an AIB market easily dominated due to a lack of competition. It was the only manufacturer to take up the Vega Nano mantle, in what looked to be similar circumstances, too. As with Vega, there’s always a chance that these designs end up on the cutting room floor anyways. The AMD Radeon VII will launch on February 7 – that’s not long to wait now – although we don’t expect AIBs to get involved beyond rebrands of the triple-fan AMD designed reference fare.